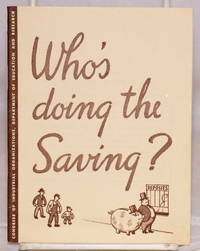 Cambridge: Harvard University Press, 1960. Hardcover. xix, 732p., first edition, shelf worn dj. Previous owner's name stamped on front pastedown endpaper, corners bumped, else good condition. Wertheim publications in industrial relations. 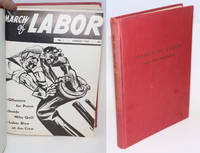 Studies in labor-management history. Washington: CIO Publicity Department, 1946. Pamphlet. 15p., wraps, 8.5x11.5 inches, paper browned else very good condition. Illustrated comic book on tax policy. Publication no. 140. "A special CIO pamphlet prepared by a tax expert and published by the CIO Tax Committee and the CIO Publicity Department." - rear wrap. Detroit, Michigan: Education Dept., International Union, United Automobile, Aircraft, and Agricultural Implement Workers of America, 1943. Magazine. 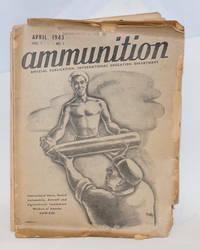 Twenty-one issues of the magazine, a near complete run for the period between April 1943 and December 1944. Issues present are Volume 1 Numbers 1, 2, 4 [plus a special legislative supplement] 5, 6, 8, and 9 and Volume 2 Numbers 1-8 and 10-14 . All ex-library with stamp on front wrap and address label on rear wrap, all with worn wraps and toned pages, else generally good condition except for Volume 1 Number 1 which is heavily worn and chipped thoughout. Detroit, Michigan: Education Dept., International Union, United Automobile, Aircraft, and Agricultural Implement Workers of America, 1948. Magazine. 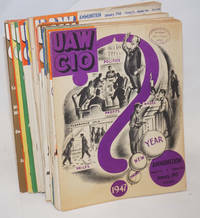 Twenty-four issues of the magazine, a complete run for the years 1947 and 1948. Issues present are Volume 5 Numbers 1-12 and Volume 6 Numbers 1-12. Various pagination, all 8.5 x 11 inches in stapled illustrated wraps. Ex-library with stamp on front wrap and address label on rear wrap, worn wraps, some unevenly toned, Volume 6 Number one misfolded, Volume 5 Number 3 with small closed tear on bottom of front wrap, Volume 6 Number 9 with pencil notation on front wrap and top corner of front wrap chipped, else generally good condition. Boston: Beacon Press, 1970. Hardcover. 557p., first edition, review copy with laid-in review slips, hardback with dj sunned at spine and lightly soiled at dj edges, else very good condition. 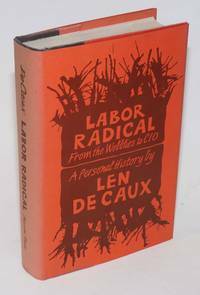 "Entertaining first-hand account of IWW during the 1920s and the 1930s, by a spirited ex-Wobbly." *Miles 49. n.p. : UAW, 1954. Two handbills, one 8.5x11, the other somewhat larger, both edgeworn and toned. 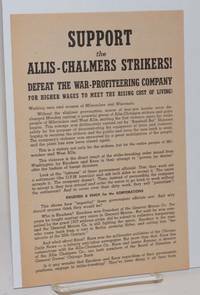 Support the Allis-Chalmers strikers! Defeat the war-profiteering company, for higher wages to meet the rising cost of living! 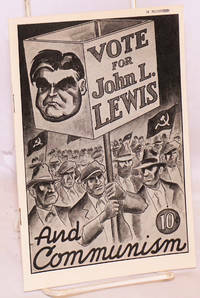 Milwaukee, WI: Communist Party of Wisconsin, 1941. Four panel brochure, paper browned else very good condition, 6x9 inches. 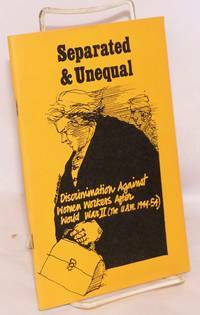 Important pre-World War II strike, by the United Auto Workers against a major defense contract. The Governor attempt to break the strike with the state militia and failed. 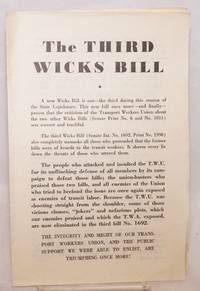 The Communist militants in the union played a key role in the strike. Milwaukee, WI: Communist Party of Wisconsin, 1941. Four panel brochure, paper browned with a few closed tears and chips in the margins else good condition, 6x9 inches. 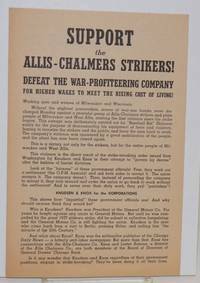 Important pre-World War II strike, by the United Auto Workers against a major defense contract. The Governor attempt to break the strike with the state militia and failed. The Communist militants in the union played a key role in the strike. New Haven, CT: Constitutional Educational League, 1937. Pamphlet. 30p., wraps, previous owner's stamp on front wrap else very good condition, 5.25x7.5 inches. The three cities are: Detroit, New York & Akron, Ohio. Silver Spring, MD: The Women's Work Project, 1976. Pamphlet. 50p., wraps, very good condition, 5.5x8.25 inches. A Union for Radical Political Economics Political Education Project. Washington DC: Congress of Industrial Organizations. Department of Industrial Union Councils, 1952. Pamphlet. 65p., wraps, 6x9 inches, very good condition. 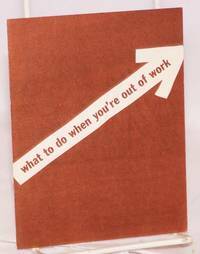 CIO Council guidebook series no. 1. CIO publication no. 209. 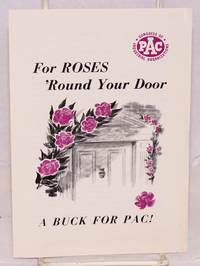 For roses 'round your door, a buck for PAC! 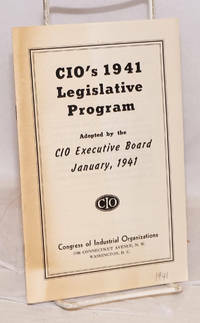 Washington DC: CIO Political Action Committee, 1951. Small four panel illustrated brochure, 5x7 inches, minor creasing else good condition. Washington DC: CIO Political Action Committee, 1952. Small four panel brochure, 4.25x5.5 inches (folded size), very good condition. 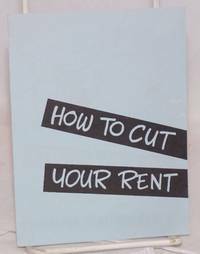 For rent control. 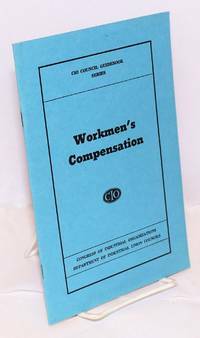 Washington: Congress of Industrial Organizations, 1941. Pamphlet. 14p., wraps unevenly toned else very good condition, 5x7.75 inches. Washington DC: CIO Political Action Committee, 1952. Small four panel brochure, 4.25x5.5 inches (folded size), some creasing else very good condition. 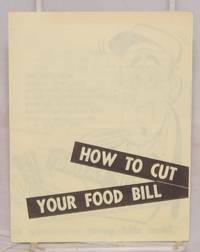 For price controls on food, urging political action. New York: Executive Board Local 100 Transport Workers Union of America affiliated with the Congress of Industrial Organizations, 1939. Four panel brochure, 6x9 inches (folded size), minor handling wear else very good condition. Opposed to the Wicks Bill on the grounds that it would damage pensions and that it would ban non-citizens from working in transit. Washington DC: CIO, Department of Education and Research, 1952. Pamphlet. 34p., wraps, 4.25x5.5 inches, very good condition. 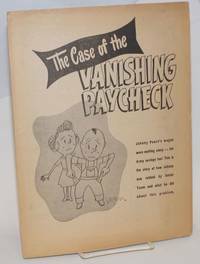 Reprint of an article from the March, 1952 "Economic outlook" CIO publication no. 204. 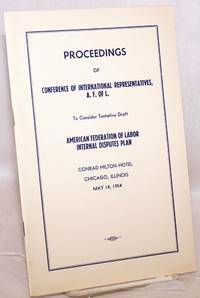 [Washington, DC]: American Federation of Labor, 1954. Pamphlet. 41p., wraps, very good condition, 6x9 inches. 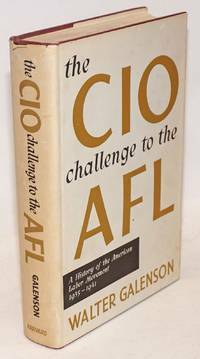 Includes discussion of AFL / CIO interunion raiding.